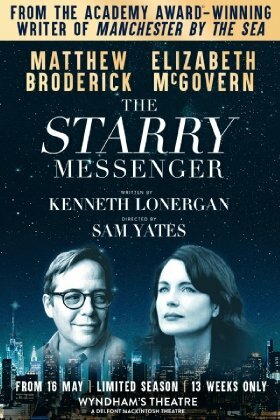 Hollywood star and multiple Tony Award-winning Broadway legend Matthew Broderick – renowned for roles including Ferris Bueller in the iconic movie and Leo Bloom in The Producers – is to make his West End debut in The Starry Messenger by Kenneth Lonergan, the Academy Award-winning writer of Manchester-By-The-Sea. The production, directed by Sam Yates (Glengarry Glen Ross), also stars Elizabeth McGovern, known to millions for her portrayal of Lady Cora in the multi-award-winning drama series Downton Abbey. The Starry Messenger will begin performances at the Wyndham’s Theatre on Thursday 16 May (Press Night: Wednesday 29 May at 7:00pm) and play a strictly limited 13-week season.